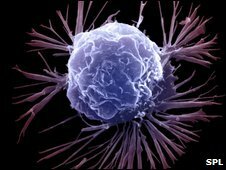 A compound that appears to target the master cells which help breast cancers grow and spread has been discovered by US scientists. In tests in mice, salinomycin killed breast cancer stem cells far more effectively than some existing drugs, and slowed tumour growth. The drug, a farm antibiotic, has yet to be tested in humans, the journal Cell reports. But UK experts warned a human version could be some years away. The reasons why, even following powerful chemotherapy, some cancers can grow back, are not fully understood. Many scientists believe a key role lies with stem cells, which can be resistant to conventional chemotherapy, remaining to 'seed' new tumours and drive their growth. The drug's potential was identified by researchers at the Massachusetts Institute of Technology, who tested 16,000 existing chemical compounds against breast cancer stem cells in the laboratory. Those which performed the best were then tried in mice, and compared to existing drugs such as paclitaxel. Salinomycin appeared to be 100 times better at killing the cells in a test tube, and treated cells were much less likely to start new tumours when injected into mice. When given to mice with tumours, the growth of the cancer slowed. However, the researchers stressed that it was too early to know if similar successes could be achieved in human cancer patients. "Many therapies kill the bulk of a tumour only to see it regrow," said Professor Eric Lander, from MIT. "This raises the prospect of new kinds of anti-cancer therapies." Dr John Stingl, group leader in mammary stem cell biology at Cancer Research UK's Cambridge Research Institute, said: "This is one of the biggest advances we have seen this year in this area of research. These scientists have demonstrated that it's possible to selectively target the rare cancer stem cells that drive tumour growth. "This research also introduces a completely new way of identifying cancer drugs. The challenge for the future is to bring this class of drugs to the clinic and to identify the patients that are likely to respond to them." Dr Alexis Willett, head of policy at Breakthrough Breast Cancer, added: "There is evidence that stem cells may enable breast cancers to form and grow. "This research provides a clue as how to identify these cells and how they might be targeted and destroyed. "It's important to remember that this is very early research and it will be some time before it is clear whether this leads to an effective breast cancer treatment."